The Earth vibrates at what scientists call its resonant frequency, or "Schumann's resonance". As natives of this planet our bodies are attuned to this frequency as well, and it has been found to be beneficial for all sorts of purposes, including healing. 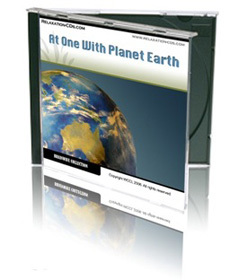 This CD has been designed to bring you all the many benefits of what native Indians call Mother Earth’s heartbeat. It starts with relaxing "earth" music, designed to calm your mind and relax your body. Then listen as the soft music and brainwave tones combine in your head to generate an inner pulse at the Earth’s natural frequency. Yet secure in the knowledge that any time in future you need to “get back to Earth”, this power-packed CD will be there waiting for you!